Winston The Reindeer is a cheery little chap - he would love to hang on your Christmas tree this year! Wherever you hang him, he will be sure to bring a little Christmassy magic into your life. Winston has a 8mm firepolished siam coloured nose, blue eyes with a cheeky smile and sienna brown antlers Beaded over a 3cm bauble Reindeer should take about 3-4 hours to bead and uses Round Peyote. Knowledge of Round Peyote is helpful but full instructions are given. There are 6 delica colours in total and the finished beadwork is approximately 6.8 cm x 4 cm not including loop. 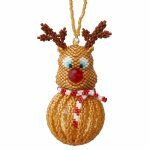 2 x 4mm amber ab crystals, 1 x 8mm siam crystal is required along with a 3cm Gold Clear bauble ornament and a small amount of polyester wadding for Reindeers head. The bead pattern supplied is 30 pages and includes over 78 colour photo instructions.